​The Bouvier des Ardennes is one of at least five bouviers that were once found throughout Belgium. These dogs were developed to drive cattle in an age before modern transportation. This task could be as simple as moving herds from one field to another or driving them several miles to the market. Three of the other bouviers are extinct, the Bouvier des Moerman, Bouvier des Paret, and Bouvier des Roulers. The only other surviving bouvier is the more well -known Bouvier des Flandres. As a farm dog, the Bouvier des Ardennes was also used as a property guard. Additionally, it had a somewhat unique role for a herder as a deer and boar hound in southern Belgium. This led the Bouvier des Ardennes to become an adept poacher’s dog during and after WWI when food was scarce. The name Bouvier des Ardennes translates to either “Cattle Dog of the Ardennes” or “Droving Dog of the Ardennes”. It is unknown how long the Bouvier des Ardennes and its ‘cousins’ have existed in Belgium. Bouviers appear in written records as early as the 1600s and most were established by the 1800s. 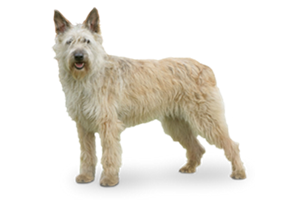 Which breeds were used in their creation are undocumented, however a tie to the German Schnauzers and Belgian sheepdogs seem likely. Since bouviers were bred for their working ability, there were once many regional varieties of a similar type. Before both World Wars, five breeds were recognized as being their own distinct variety. These were the Bouvier des Ardennes, Bouvier des Flandres, Bouvier des Moerman, Bouvier des Roulers, and Bouvier des Paret. Both World Wars were devastating to all European dogs and the bouviers suffered with them. The Bouvier des Flandres survived with the strongest numbers, as it was employed by both the French and Belgian armies. The Bouvier des Ardennes had few specimens remaining, and even less breeding stock. Despite this they gained Fédération Cynologique Internationale recognition in 1963. By the latter part of the 20th century it was believed all bouviers save the Bouvier des Flandres were extinct. Surprisingly in 1985 researchers studying milk in pregnant cattle found dogs similar to the Bouvier des Ardennes in a rural farming community. Fanciers began rebuilding the breed and a second surviving group was located in 1996. Today the Bouvier des Ardennes remains primarily a working dog inside Belgium. Their recovery has been slow, but numbers appear strong enough to secure the breed’s survival. Is the Bouvier des Ardennes Right for You?